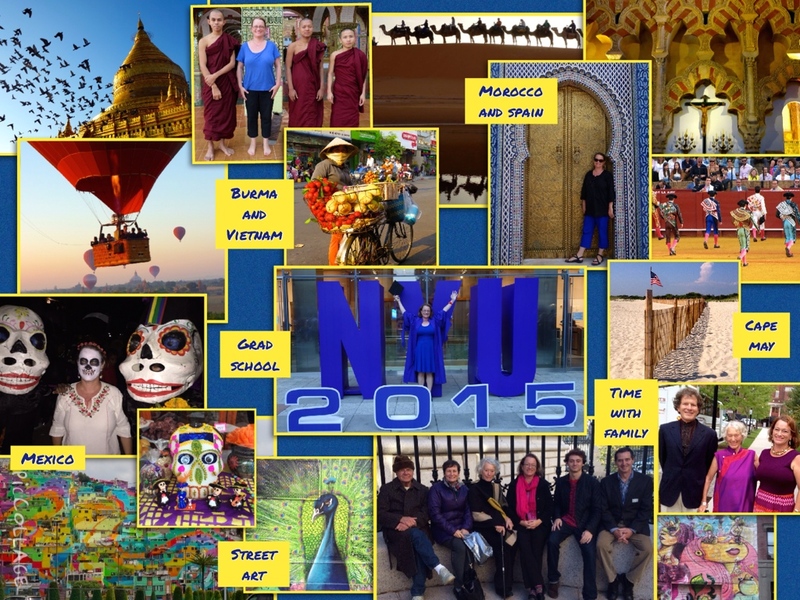 2015: What a year its been! Cheers to 2015 and Happy New Year! My big accomplishment of 2015 was completing my Executive Master in Public Administration at NYU Robert F. Wagner School of Public Service. It took me a long time to decide to go back to school and I'm so glad I did. I refreshed my skills, updated my knowledge, and extended my network with a whole new group of amazing people. I haven't known how to personally respond to all this anti-Islam talk. Posting on Facebook isn't enough. Reaching out to Muslim friends isn't quite enough. So I decided to go out and explore the Islamic community in Bay Ridge and be reminded of how much I love the culture. I got in the subway on the UWS and got out in the Middle East and it was awesome! 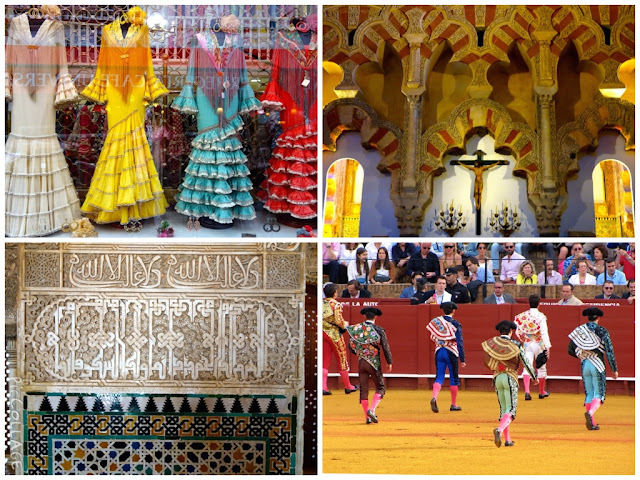 Spice filled aromas, hookah bars, honey laden sweets, glittery dresses, gold jewelry, and the melodic sounds of various Arabic dialects. I spent a little money and engaged with the people I saw. Not sure its anything, but it can't hurt. Although I mostly focus on the rest of the world on this blog, New York is pretty and I love to explore it too! I went to Oaxaca to participate on another Global Exchange educational tour where we learned about the 16 indigenous peoples who live in the Oaxacan State. 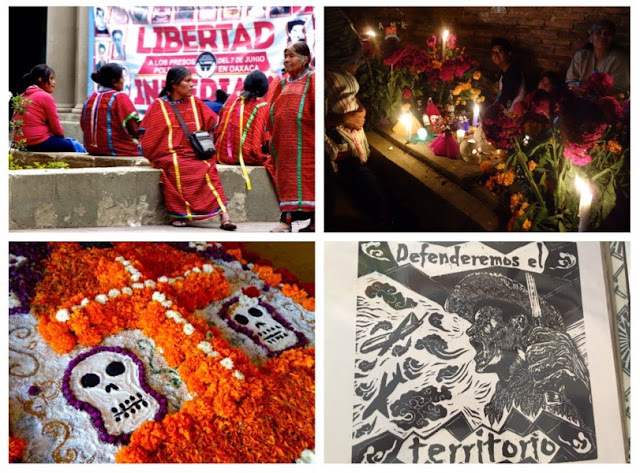 We learned about the traditions surrounding Day of the Dead/Dia de los Muertos and also about many other aspects of the cultures including their ongoing struggles for automony against the Mexican state. 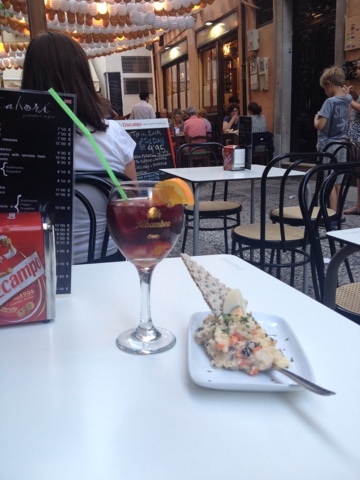 Spain, thank you so much for welcoming me with you chill "manana, manana" attitude. I felt so relaxed and comfortable visiting you. I loved sitting at your many outdoor cafes, eating your delicious tapas that came with the abundant fresh fruity sangria giving me a chance to try so many different tastes. I loved your ornate Moorish architecture. It moved me to tears. The tile work and carvings were so beautiful. The symmetry felt so soothing and solid. Your cultural and colonial connections to my world (Latin America and America) are so visible and yet so complex. I thought you would be so much more developed, but in some ways you felt almost as developing world as the colonies you left in Latin America. I loved that part of you too. You are the lace between Europe and Latin America. I hope we will have many chances in our futures to get to know each other. 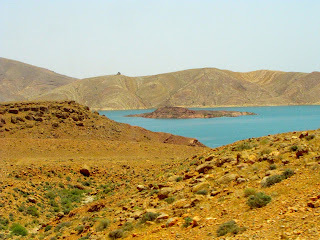 To see Morocco one must drive long distances between the sights. Prior to the trip I was a little worried about all the driving, but it turned out that I was happy to look out the window and soak in all the sites. 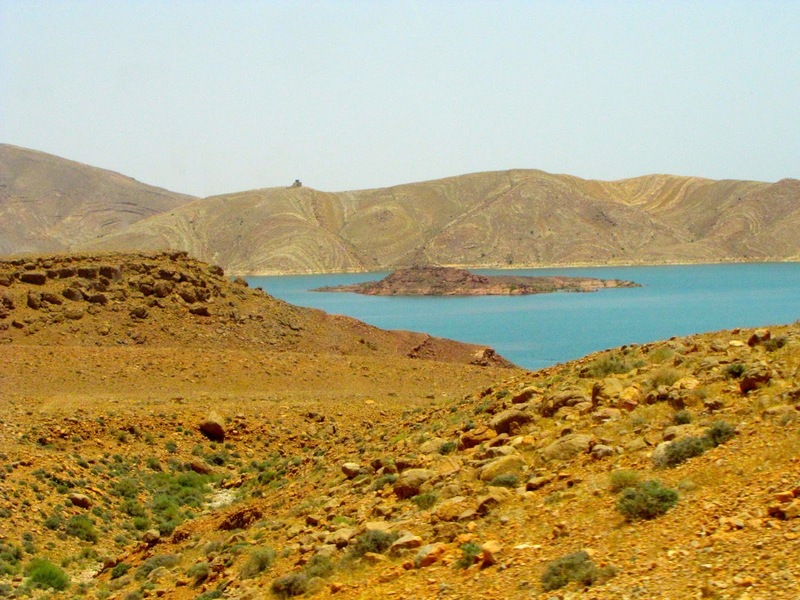 Morocco's landscape was much more varied than I was expecting. The images in my head were of camels and rolling sand dunes. I expected a dry, dusty land, which did exist in places, but there was so much more. First off, Morocco grows lots of things. 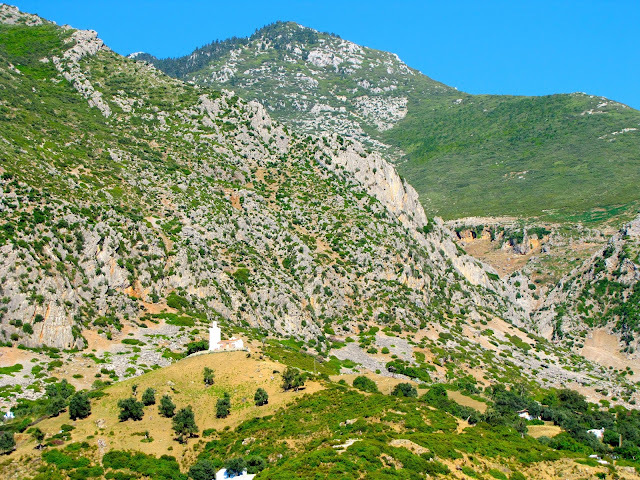 The land is covered with fruit trees producing apricots, apples, cherries and of course olives. There are so many olive trees planted uniformly along big stretches of rolling hills, There is lots of lush green farmland and fuzzy wheat stalks blowing in the wind. We also passed miles and miles of argan trees whose seeds produce the magical oils that have changed my hair over the last few years. Second, it seemed like around every bend was another dramatic landscape. Rock formations like the Grand Canyon melted into turquoise lagoons. 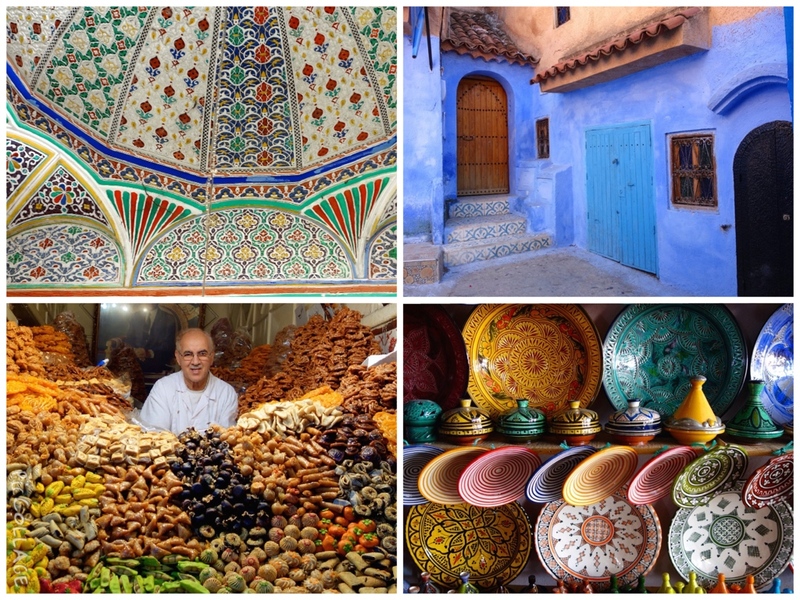 Rolling hills covered with olive trees descended into lush farms filled with huge date palms. 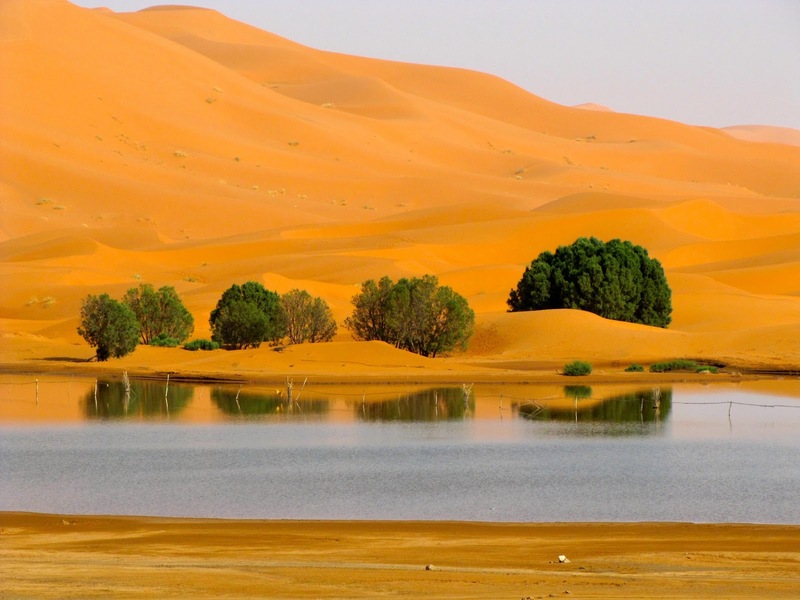 And then of course to the south were the red dunes of the Sahara which pop up out of a barren gray desert floor. 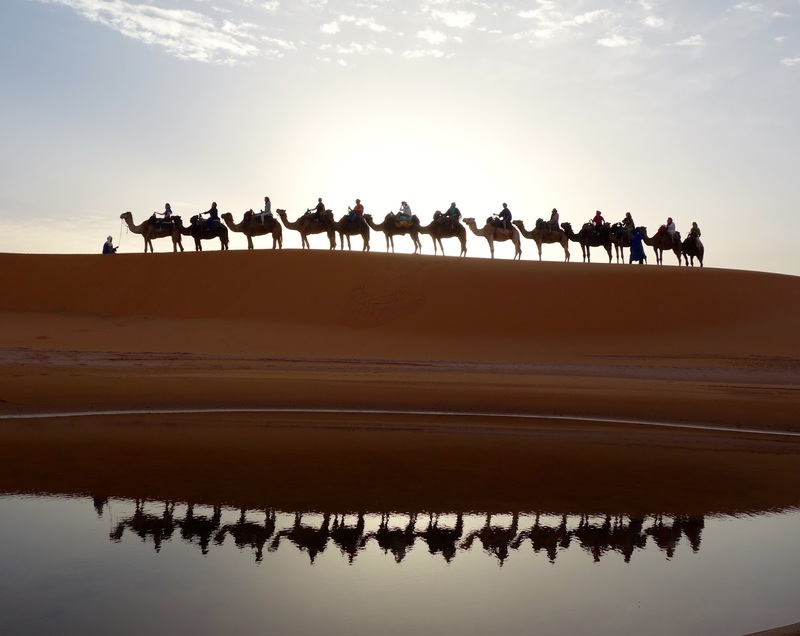 So all said, the key thought in Morocco is enjoy the journey. Practicing English in Hanoi. A least I'm useful for something! 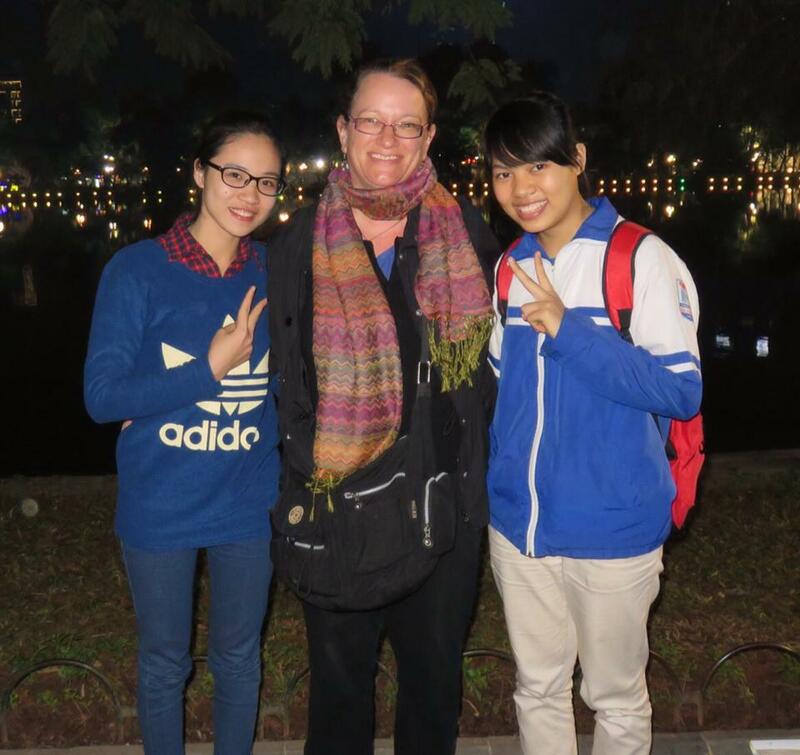 Last night I went walking in Hanoi, Vietnam and met these two college girls who wanted to practice their English with me. They practice all the time at home but have never had the courage to ever ask anyone in person, but said they asked me because I seemed friendly. They told me they learn English by watching Ellen and MasterChef and could even name all the characters of Friends. They love Taylor Swift and are sad Miley Cyrus has been acting so crazy. They took out their Learn English lessons and had me read to them, then read to me and asked me to correct their pronunciation. This was just what the doctor ordered for me, since this trip had made me question if my presence is really good for the societies that I'm seeing. The affect of tourism sometimes worries me, but right now I feel like I made a small contribution and got to experience the best part of travel: personal interactions that make the world a smaller more interconnected place. And PS, I already got an email from one of the girls so hopefully I can be her English-speaking pen pal. What is really going on in Burma under the surface? While traveling in Burma it's hard to figure out what is really going on. On the tourist side, you see a country changing quickly to make room for the growing tourism numbers. The story you hear is that the military government which has had a strict control on every aspect of life here for 60 years decided to begin to open up and allow more political freedom. They finally released Aung sung Sui ki from house arrest. She won a Nobel Prize for her efforts to open up the country and has been one of the worlds most famous political prisoners. When they released her she told the world it was ok to come to Burma again and the travel boycott being observed by many in the west was lifted, allowing millions of travelers to visit. Tourism numbers show 360k coming in 2006, 790k coming in 2010 the year the change happened and 2 million coming in 2013. So on the one hand, growth in tourism is rapidly changing the country and opening it up to the outside world. Tourists are everywhere. New hotels and restaurants are popping up. But then on the other hand one is always wondering what is really going on and if the military really does have much more control than they admit. Our guide is very careful when he answers our questions. Tourists are only allowed to go to certain areas of the country or they need permits that are virtually impossible to get. I find myself eager to believe the story that things are changing fast and political freedom is rising and that the upcoming elections this year will bring a new president directly elected by the people, but I also feel myself worrying that that is not going to happen and many of the changes are much more on the surface. And the frustrating part is there really is no way to figure out what is the truth. I have been getting Google Alerts about Burma news since I got back and feel a bit naive about how little I knew about the ethnic conflicts happening all over the country. The country officials clearly want tourists to see some stuff and bypass a lot of other issues. I still hope Burma is on the road to the right kind of change since it was a beautiful interesting to place to visit. I hope tourism is used as a liberating force, not as a way to get money to use to keep the Burmese people in line. My trip to Burma was amazing. The faces, the color, the culture, the religion, the friendly openness of the people... all blended to make this one of my favorite trips of my life. Burma is a poor country that sits very low on the development scale. Like so many others, colonialism tore it's identity apart and it has never really found it's balance since. Up until 2010, it was largely cut off from the world and under the control of a harsh repressive military regime. Some equate with the harshness Burma was forced to endure under colonial rule. It is hard to figure out where the country stands right now. Things have definitely changed and the country is opening up to the outside world. Lots of reforms have been made, but the jury is still out as to weather the military is really ready to cede full power. 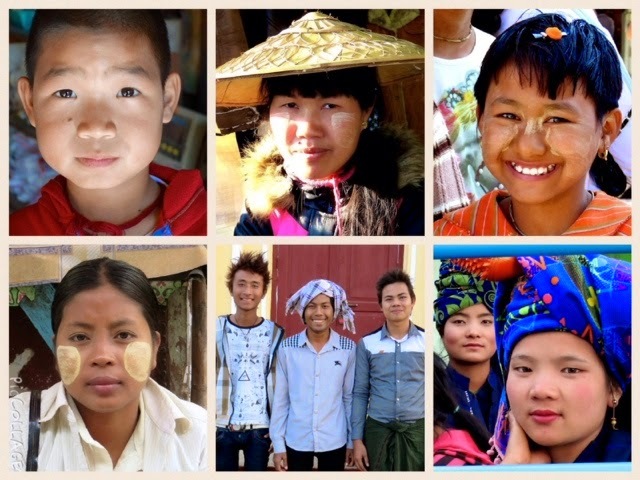 One issue is that Burma is one of the most ethnically diverse countries in the world. The government recognizes 134 different ethnic groups in a country the size of Texas with a population of about 60 million. The new freedom is opening up space for contentious ethnic divisions to fester. As often happens, needs and expectations of the people far outweigh results. We visited Bagan, the city that was the capital of the Kingdom of Pagan, the first kingdom to unify the regions that would later constitute modern Burma. From the 11th to 13th centuries over 10,000 temples were built and today over 2000 of them still stand in a small radius. One morning I got up and took a balloon ride at sunrise over the temples. It was a magical experience to see the valley below light up and see then full extent of how many temples there are. We were very lucky to be in Bagan for it's biggest festival of the year. It coincided with a full moon and a Sunday so it was even bigger than it might have been. Travel kismet. People from rural villages came down into town and camped for up to a week. They shopped at pop-up markets and visited temples. The faces were amazing and their excitement about seeing us was palpable. Burma just recently reduced the cost of SIM cards for cell phones down to $1.50 from $200. It means they are accessible to everyone and now EVERYONE seems to have a smart phone and their nose in it. It also means everyone suddenly has a camera and they love to use it. We were a fascination and we often noticed people sneaking a picture of us. We started to ask everyone who took a picture of us for a picture of them and I posed in many shots. The more I travel, the smaller the world gets and the interconnections of culture and history from country to country become more apparent. Whether its the similarities between countries with the same colonial powers, who then share traditions, historical timelines and architectural styles, or migrations of workers and the mixing that happened due to the prominent trade routes throughout Asia, or just that borders were often placed haphazardly so similar cultures live in multiple countries. And then theres religion... it is a huge connector in so many places. Burma brought all these things together for me. 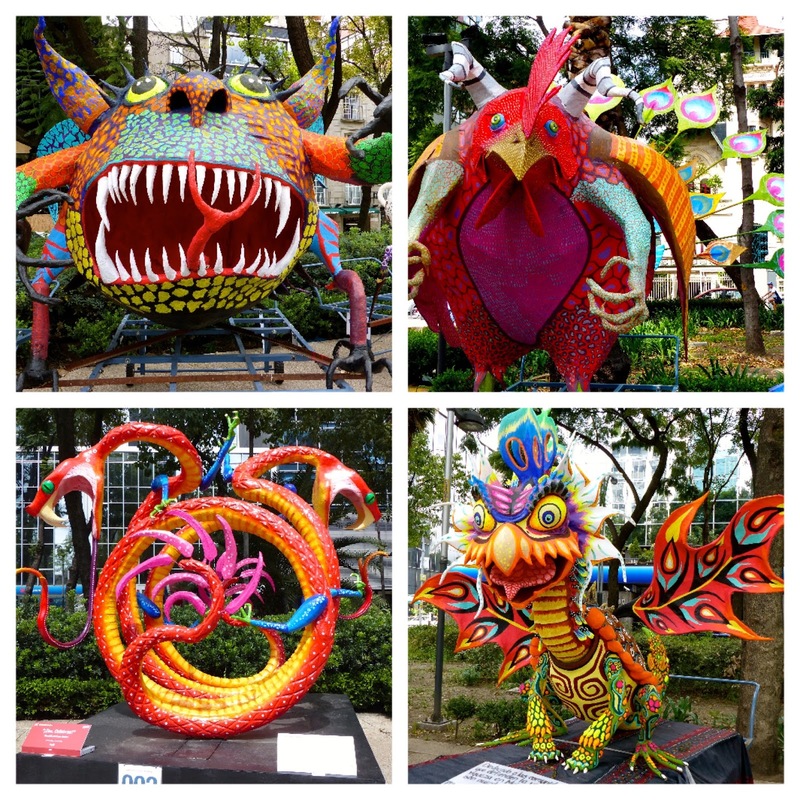 The intersecting cultures were prominent and very visible. 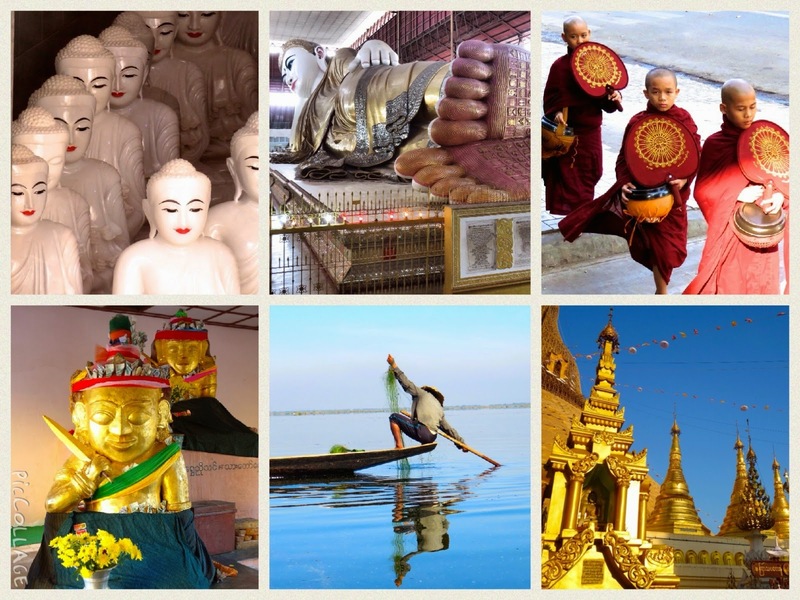 Burma shares a border with Thailand, Laos, China, Bangladesh and India and there are influences of them all in the faces, food and traditions. The biggest tug seems to be between the influence of their big neighbors, India and China. While seeing the Chinese influence didn’t feel unusual, since China is the huge imposing neighbor to all of South East Asia, I was not expecting so much of the Indian feel. Between being a close neighbor, sharing trade routes for centuries and the huge influence the British Empire had in connecting the two countries, at this point India is ever present. Please forgive the roughness of these observations. I'm not a trained anthropologist, so I'm just throwing out random things I noticed here. Its hard to put to words all the times someone I was with, or I, just got that feeling that something felt like India. It was subtle and wonderful. There were little India reminders everywhere. Religious pilgrims piled high in oxcarts dressed brightly for festival days. Overfilled trucks coming home from the market. The traditional dress for men and women is a long skirt, called a longyi, a long sarong type cloth, similar to India, (and even Coastal Kenya), is a tradition adopted during British rule. Food for sale on the streets includes samosas and other familiar Indian delights. People drink lots of chai. Dinner one night was served one a huge platter with separate compartments just like a thali, a Southern Indian style dish. Some of the Buddhist temples were built in the same style as Hindu temples and there are also were ornate painted Hindu temples in Yangon, the capital. And then the faces... So many of the faces are Indian faces. I recognized a lot of influence of genes from Kerala and Tamil Nadu in Southern India. And other faces had darker Indian skin tones with Asian features. The faces, were so, so, so diverse… It was heaven for a portrait photographer like me. And last but not least, frankly, there just was a bit more of the chaotic, cultural vibrance I love than in a typical South East or East Asian city. I've seen 30% of the world, but there is still so much to go! 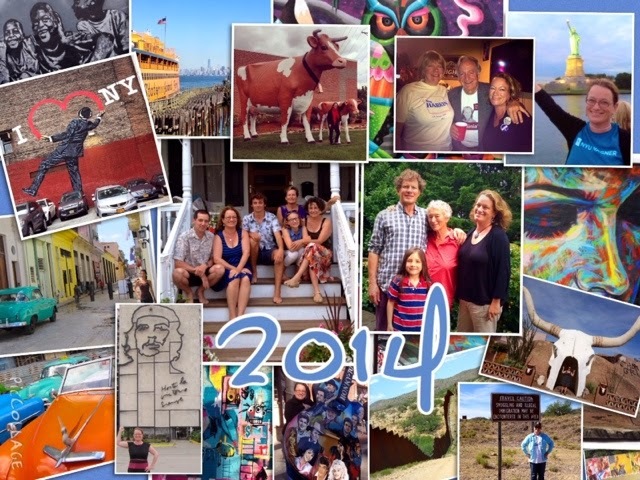 Before 2014 fades away into the past I wanted to send out my greetings and updates. As always, I've been a busy bee. Most notably after taking the plunge last year and grudgingly starting an Executive Master in Public Administration degree program at NYU Robert F. Wagner School of Public Service, I ended up loving it so much that I decided to go full time and really take advantage of the opportunity. These classes seem even more interesting than undergrad now that I have a lifetime of experience under my belt. It helps connect so many different dots! Plus I guess I'm just that geeky that I am enjoying immersing myself in a deep culture of learning and discussion.